The small village of Parra, which falls between the North Goa commercial capital, Mapusa, and the queen of beaches, Calangute, has got a new look. A visit to the place right from Parra junction to the Canca junction makes you nostalgic, giving a glimpse of the erstwhile Portuguese regime. SURAJ NANDREKAR visits the place to know more. PARRA: Even though the Indian armed forces liberated Goa in 1961, the fusion between the cultures of the colonist and colonizer is still evident in Goa’s food, music, dance, architecture, laws and even language. A small village, Parra, which is home to Defence Minister Manohar Parrikar, has been given a new heritage look, with restoration of old houses and the ancient architecture of footpaths and bus bays. The village centred-between Mapusa and Calangute has got a new look, with widening of roads with dividers, restoration of heritage houses, footpaths, bus bays, illumination, etc. 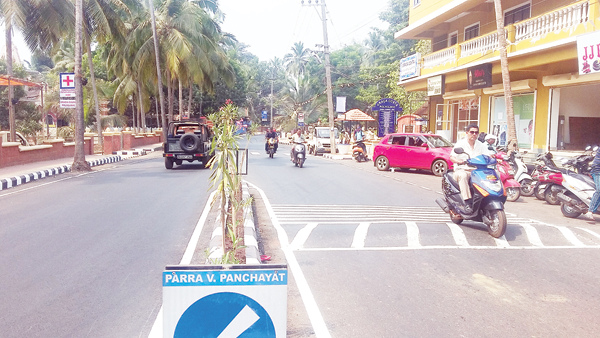 “The road passing through Parra is an important point, considering the importance of both Mapusa and Calangute, and hence, it had to be done up in a special way,” says Parra Sarpanch Delilah Lobo. She said that prior to 2012, the village was always ignored and no development work was carried out. “The road sees heavy traffic during the peak hours, and as such, many fatal accidents have been witnessed on the road, which was very narrow, hence, it was necessary to widen it,” she said, adding that the local MLA took up the issue and kept his election promise of beautifying the village. Speaking to Herald, Calangute MLA Michael Lobo said while the government has taken up the work of road-widening and hot-mixing at a cost of Rs 2.2 crore, it is the corporates and private businesses who have contributed largely through Corporate Social Responsibility (CSR) activity for the beautification of Parra. “The bus bays, the partial restoration of heritage structures and painting, murals, benches, etc, have been contributed by the private sector,” he said. Lobo said a similar kind of beautification would be taken up at the Canca junction and Nagoa circle in Calangute, besides Candolim. “Calangute attracts lakhs of tourists every year and many of them pass through Mapusa and Parra, to Calangute, especially Indian tourists coming in their own vehicles or trains and luxury buses. So it is fitting to give them a taste of what Goa is all about as they enter Goa,” Lobo said. He also stated that private companies have also contributed towards making the village a garbage-free zone. “We have declared a garbage-free zone as the private companies have also donated around 20 dustbins, to be kept on the main road and which will be cleared every day, and if need be, even twice so that the village gets a clean image,” he said. While the beautification is spoken about, the villagers are happy especially for the widening of roads. “It was getting really difficult for us during rush hour and many youth have lost their lives on this narrow road. We are happy the road is widened,” said Wilfred Fernandes, a resident of Parra. Nikhil Naik of Calangute says that such initiatives also need to be taken in the Calangute market, which often sees traffic congestion.